Ah, a fresh new day and a fresh new month. So many possibilities. So many goals just waiting to be made…and completely forgotten halfway through the month til eventually you decide…better just wait until another fresh start new month comes along. Anyway, today is the first day of Blogger, May I with Katy and Meghan. In case you missed it yesterday, we’re blogging every day this month and we hope you’ll join with us. And not get sick of hearing from us every.damn.day. Today is Introduce Yourself. 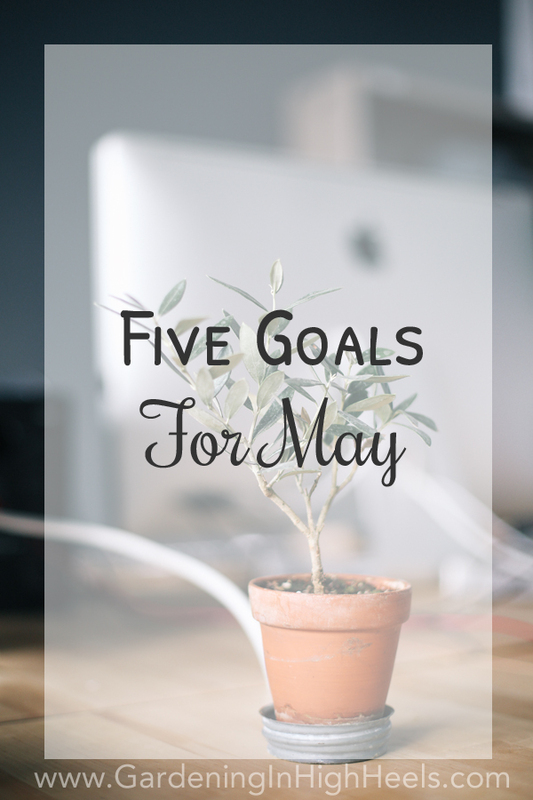 Since last week, I pretty much just wrote about myself all week and I don’t want to subject you to that too much, I’m going to introduce you to myself through my five goals this month. Didn’t see this coming, did ya? I’ve done this before a long time ago and they weren’t the best quality things around. I hope I can hit quality and quantity this time around. I’m so thrilled Katy asked me to join in the fun and help her lead the charge. And I can’t wait to dig in and really get going with this challenge. I may be am cheating here. I know I’m going to complete the marathon. But people write things on their to-do lists that are already to-done just so they can cross something off, so I can do that here, right? I knew I wouldn’t really start to work in the yard until after the marathon, but I can’t put it off any longer. There probably won’t be many more frosts in Pittsburgh; I’m thinking mid-May will be the good time to get everything in the ground. I’ll definitely be planting the staples – tomatoes, peppers, green beans, zucchini, peas, eggplant, herbs – but I also want to add some marigolds in to keep critters out. I never have, but I’m interested in seeing if it’ll do anything to alleviate the groundhog/bunny problem. I have things thrown in my office because I quite literally have no where to put them. I don’t have any office furniture in that room, so the supplies I’ve moved into my house are just sitting there. It’s driving me nuts! I have to get it off the floor and put away somewhere and have a functional space for my computer, sewing machine, scrapbook supplies, Post-Its, etc. Pretty much just the little flotsam and jetsam that accumulates in life. When things get busy, the first things to go to the wayside are posting on Twitter, replying to emails, cutting coupons. Doing dishes. At least I don’t have a problem remembering to grocery shop and eat! Introduce yourself and link up! What are your goals for the month? Starting plants from seeds is such a labor of love – kudos to you guys! That’s a fun reminder of a wonderful weekend every time you have a carrot. Very cool that you got to take seeds home! You are going to ROCK this month!